The Moscow Patriarchate website noted that the Patriarch of Antioch expressed his regret over the fact that Patriarch Bartholomew of Constantinople "does not hear the voice of faith"
MOSCOW, January 22. /TASS/. Greek Orthodox Patriarch of Antioch and All the East John X thinks that the church split in Ukraine is politically motivated, the Moscow Patriarchate website informed on Tuesday. "The split in Ukraine, organized by non-Orthodox people is a political process masquerading as a religious one," the website quotes the patriarch’s statements made during the meeting with the Russian delegation headed by Russian State Duma MP Dmitry Sablin. The meeting took place in Damascus on Tuesday, January 17. The Moscow Patriarchate website noted that the Patriarch of Antioch expressed his regret over the fact that Patriarch Bartholomew of Constantinople "does not hear the voice of faith". 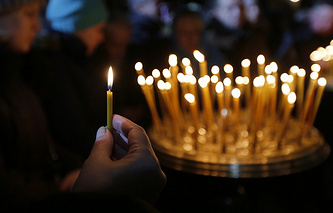 At the same time, Chairman of the Russian State Duma Committee on Civil Society, Public and Religious Organizations Sergei Gavrilov, who also participated in the meeting, stated that Western institutions attempt "to violate the integrity of the Antioch Orthodox Church in Syria", stressing that the church cannot allow for a "Ukrainian anti-Orthodox scenario" to develop.